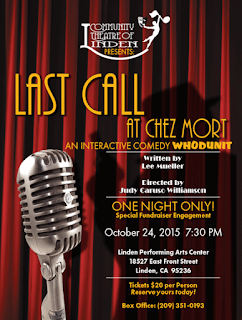 “Last Call at Chez Mort," a one-night only interactive who-done-it to benefit Community Theatre of Linden. The show is 7:30 p.m. on Oct. 24. The comedy by Lee Mueller is set in the 1940s and includes gangsters, bodyguards and audience participation. Francois Rambau is the show’s pianist and Judy Caruso Williamson directs. Proceeds benefit the company’s youth program. 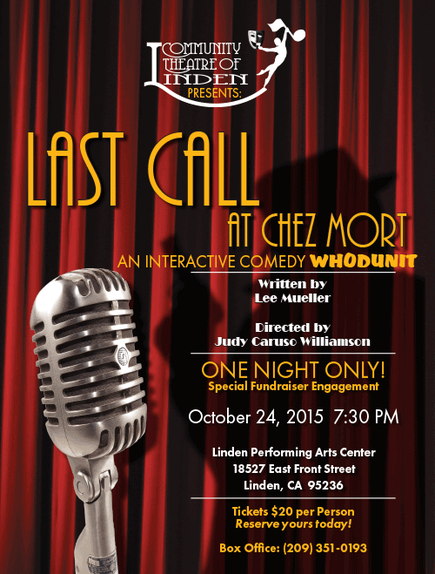 The show will be in the Linden High School Performing Arts Auditorium at 18527 E. Front St. Linden CA. Tickets are $20 and may be reserved by phoning (209) 351-0193.